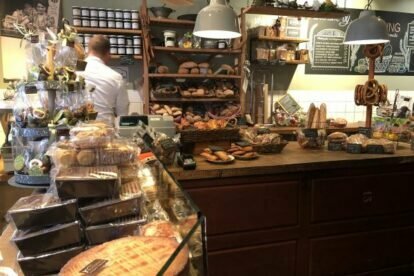 When walking the Van Vollenhovenstraat in the historic Scheepvaartskwartier, your attention will be grabbed by the smell of fresh bread and croissants. Follow your nose to Jan Bussing Boulangerie. This bakery is a favourite with locals and visitors alike. The bread is delicious and there are some great flavour combinations. For me, the fig and almond bread and the prune and hazelnut bread always end up in my bag. There are a variety of sandwich rolls to choose from — be it the petit pain to spelt varieties and they are so delicious and really don’t need anything on them. The (cheese) croissants are out of this world! The baguette is a favourite in any season; no Rotterdam barbecue is complete without it. The smell of fresh coffee completes the senses. Fortunately, there are a few tables to have a great breakfast, coffee with a pastry or lunch in the bakery. There are a variety of sandwiches, but my personal favourite is the roast beef. Now, it’s not all about the bread; the pastries will leave you in a state of exhilaration. The raspberry, chocolate, caramel or lemon tartelette are all delicious tastes of France. The typical Dutch “cookie” the bokkepoot which is two pieces of almond meringue with the ends dipped in chocolate and sandwiched together with cream is the very best version you can get.